This template creates a call option for buying land and/or buildings. The buyer buys the right to buy the property at a given price within a certain period of time. 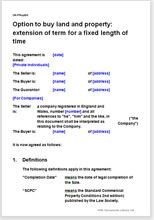 This document also includes a provision for the buyer to extend the option exercise period for a fixed length of time in return for an additional payment to the seller. Using an option agreement to buy land or buildings for development allows an agent or a developer to minimise risk, whilst at the same time providing the seller with a payment regardless of whether the buyer exercises the option. It can help incentivise a property owner to cooperate in securing the future event the buyer is seeking and, depending on the sale price agreed, let the buyer purchase at a discount to future market value. This document is likely to be used in situations where an event for which the option holder is waiting (such as grant of planning permission) could be delayed, and the holder wants to reduce the risk that the option term might end before the event. Net Lawman specialises in property option agreements. You can find our complete range of templates at: Property option agreements.